Dual-core is so yesterday, it’s all about the quad-core processors in this day and age. While most of the news surrounding the new processors has been about NVIDIA’s Kal-El, Qualcomm has announced plans for it’s own quad-core processing beasts. The next generation Snapdragon processors would be clocked as high as 2.5GHz in single, dual and quad cores. 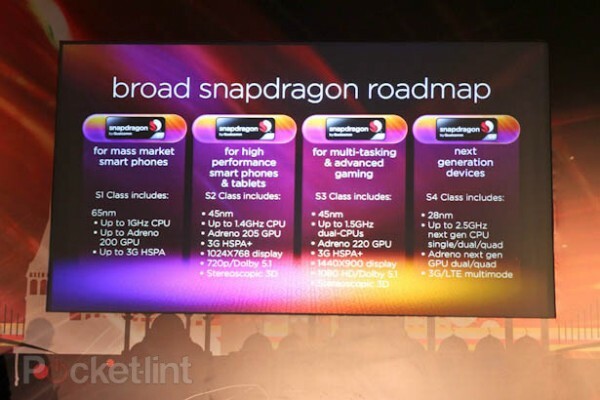 The S4 class chipset will also offer Adreno Graphics, 3D, 1080p HD, as well as supporting 3G and LTE connectivity as standard. These beastly processors will be available to manufactories by the end of the year, with devices hitting the market by the start of 2012. I can’t wait for CES and MWC, now let’s hope battery innovators can come up with something “juicy”. Small Batch of DROID Bionics Having Radio Issues, Replacement an Option?